Calxa has the option to create custom report templates. These templates are saved in your Calxa database but sometimes you may want to export these templates for backup purposes or to import them into another database. This help note will guide you in exporting and importing your existing templates but does not explain how to create or edit custom templates. Please refer to the help note Report Designer: General Concepts and its related articles for help with customising reports. 1. Select the custom report you would like to export. 2. Expand the edit template section at the bottom of the Report Templates column to display the template properties. 4. Navigate to the folder on your computer where you are saving your report template to. Type a name for the file in the File name box and click Save. A report template must be imported or opened from within the same template group that it was originally created. To gain access to the Edit template tools required for importing you must first have an existing copy of a report template. If you don’t have an existing template copy, follow the steps below, otherwise skip to step 2. 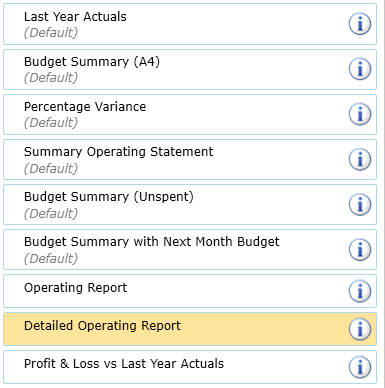 Select a default report template within the required report group (in this example we are using the Budget Summary template which is from the Budget Summary group) and click the button. 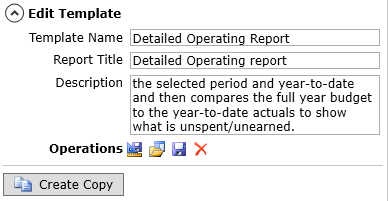 You will see the report template copy appear in the report template list. Select a custom report template then click the button at the bottom of the window to expand the Edit Template properties (shown below). Click the Open template layout button . (Second button in the Operations menu) and navigate to the location where you have saved your custom report template and click Open.